Winter finally decided to make an appearance here in northeast Ohio a week or so back with the first significant snow, which was then followed up by a polar vortex that resulted in some extreme cold temperatures for a few days. Making photographs in the cold and snow is typically not that fun because you need to protect yourself and your gear, but after the extreme cold we experienced this past week the temperatures rose to where it was bearable to be outside for extended periods of time. Plus we had sunshine. So on Saturday I decided to venture out to downtown Cleveland, specifically along the shores of Lake Erie, to make some photographs of the snow and ice before it melts away due to the spring like temperatures that are being predicted for this coming week. Below are some of the photographs I made while out on my Saturday adventures. Trees in Lake Erie surrounded by ice and sheet piling near the East 55th Street Marina. Only thing left from the old Lakeshore Power Plant are the water intake and exit channels. The channels were used to cycle cooling water in and out of the plant while the plant was in operation making electricity. The plant has since been torn down. This is the East 55th Street Marina. The skyline of Cleveland is visible in the background. Just beyond the marina to the left is a renovated building that was vacant for many years. The building back in the day was used to store cars that came to Cleveland by way of car ferries from Detroit, Michigan. With Lake Erie to my back I make this photograph looking over the ice covered rocks along the shoreline. It almost feels like you are on different planet. I have seen a good number of photographs of this tree at Edgewater Beach. It is such a good subject given the color even in the dead of winter. I am standing on the beach and I am shooting across the frozen water which is mounded up. Railroad lift bridge at the mouth of the Cuyahoga River. When the river is not frozen, this bridge will go up and down several times a day to left river traffic go by. Notice the trail of foot prints in the snow on the the ice from a critter that made its way across the frozen river. Cleveland’s old Coastguard station at the mouth of the Cuyahoga River. The sun was rather strong behind my back and the shadows of the tree branches on the frozen lake caught my eye because it leads you to the building. Walking around Wendy Park, I spotted this tree that provided a frame for the tower of the Coastguard Station. My Saturday adventures started out cold, but I was prepared and wore a few layers and ended up being rather warm. I quickly found out that walking around along the shores of Lake Erie in the winter can be challenging. There was quite a bit of ice to watch out for, which was covered with a light layer of snow. I took my time walking and watched every step I took to ensure I stayed upright. Thanks for for viewing my photographs. Please feel free leave comments or questions below. After the photo adventures with James and I at the beginning of June we talked about getting together yet again before the unofficial end of summer to explore more of Cleveland. We made that happen last weekend. James and "The Boy", his son David, came to Ohio to spend about a day (afternoon and a morning) exploring some areas between Akron and Cleveland. Below are some of the photos I made, after dodging some rain and tough lighting conditions, on our Friday afternoon adventures. Cleveland skyline from Edgewater Park. Cleveland skyline from Edgwater Park. Great Republic freighter heading up the Cuyahoga River. Note we just happened to be at the right place at the right time to make photos of the freighter going up river. Great Republic freighter passing under the Detroit Superior Bridge on its way up river. 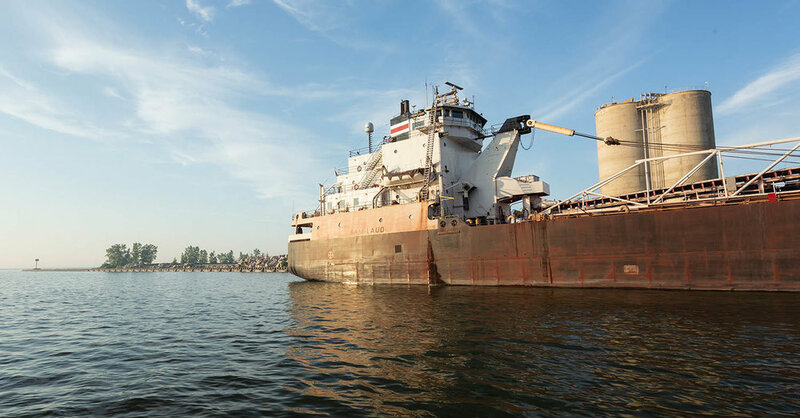 Great Republic freighter heading around a bend in the Cuyahoga River. This is looking under the Detroit Superior Bridge and looking through supports of the Center Street Bridge. Key Bank Tower though the supports of the Center Street Bridge. Yea, I am an electrical engineer and couldn't resist. Double circuit tangent transmission structure. Ohio & Erie Canal Reservation. The foreground is the Ohio & Erie Canal, on the right is a double circuited transmission line, the pipe on the left is an interceptor pipeline for sewage and on the far is a very active rail road bridge. More to come of our Saturday morning adventures around the Akron area. Thanks for looking and feel free to leave comments below. Also, if you are interested in a print of anything you see, please send me a note. Last year was quite busy for my wife and I with deciding to make the move back to Ohio to be closer to family. We are amazed with how smooth it all went with starting my new job, selling our Michigan home, buying our Ohio home and getting our belongings moved to Ohio over the course of about a month (give or take). All I can say is that we both know God had his hand on the entire process and it was all with his timing. We had talked for a few years prior to 2017 about moving back, but it never felt right. When the job opportunity came up in 2017 everything felt right. It has been one year and a few days since I have started my new job. I love my new job and I fit right in with all my co-workers. My wife and I are also enjoying our new home and being closer to family. With the move to Ohio we left behind some friends we have made over the years spent in Michigan. My wife has made a trip back to Michigan to visit, but I have not gone back yet. A few months back an opportunity was advertised by the Cleveland Photographic Society to tour the Mansfield Reformatory so I asked my friend James to come along. He was able to make the trip and we spent the evening before hand exploring the mouth of the Cuyahoga River and the Cleveland Metroparks' Wendy Park. Below are some photos from our adventures for your enjoyment. 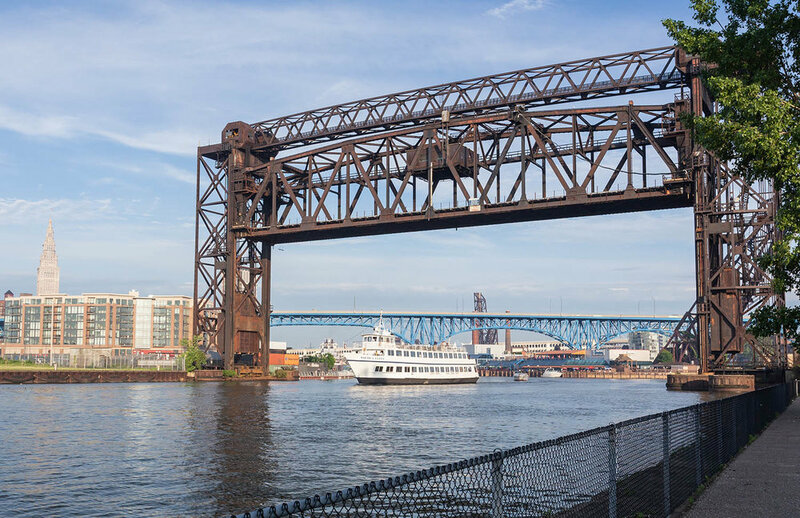 Nautica Queen passing under the Norfolk Southern vertical lift bridge. 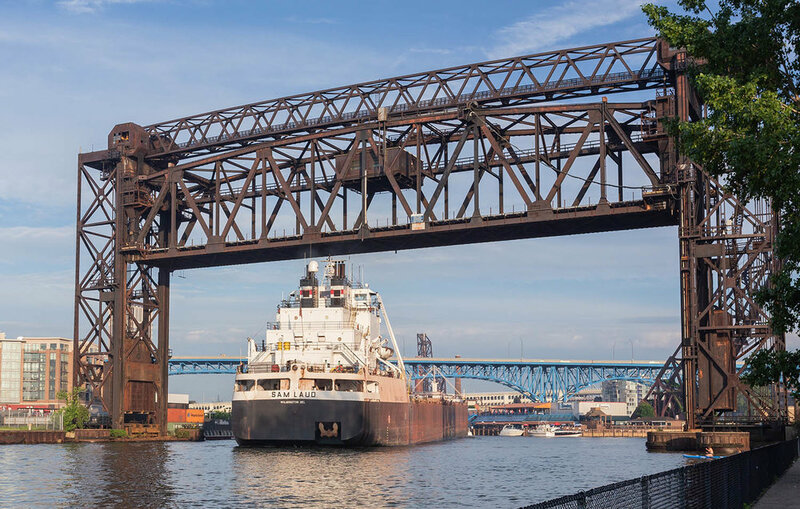 Sam Laud passing under the Norfolk Southern vertical lift bridge as it backs out to Lake Erie. Sam Laud backing out to Lake Erie. Sam Laud turning around behind the Historic Cleveland Coast Guard Station at the mouth of the Cuyahoga River on its way to Lake Erie. 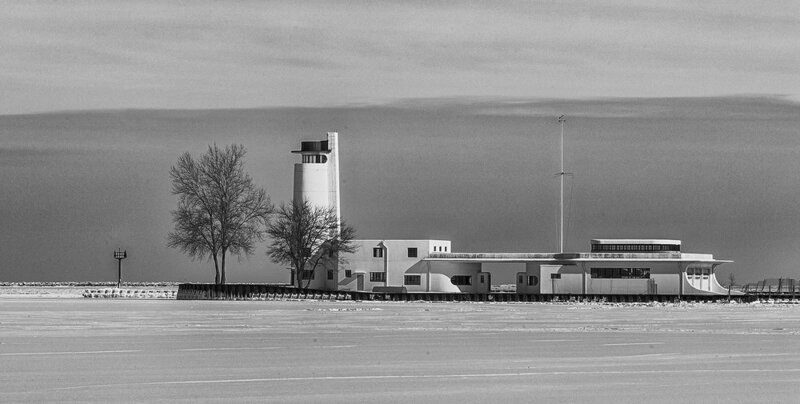 Historic Cleveland Coast Guard Station at the mouth of the Cuyahoga River. Located within the Cleveland Metroparks' Wendy Park.